Allison Sekemoto survives in the Fringe, the outermost circle of a walled-in city. By day, she and her crew scavenge for food. By night, any one of them could be eaten. Some days, all that drives Allie is her hatred of them - the vampires who keep humans as blood cattle. Until the night Allie herself dies and becomes one of the monsters. Allison is an unregistered. She lives in the fringes, outside the vampire city. A world that was torn apart by disease, humans are considered as pets by vampires, who are now the upper class society. Humans are expected to register with a database, so vampire leaders can keep track of their whereabouts, and donate blood. Any registered citizen caught not donating regularly... Allison knows all too well, her mother was a victim of the cruel stranglehold the vampires lord over the remaining humans. Allison spends her days hunting and foraging for food to help keep her small group alive. If only starvation were their biggest concern. Diseased animals and former humans, now rabid, seeing her as nothing more than a source of food. She loathes vampires, and the cruel world in which they've created. She would rather starve than become a servant to any bloodthirsty vampire. When Allison is attacked by rabid's and fighting for her last breath, she meets Kanin, who gives her a choice. She can choose to die a slow and painful death, or be reborn as a minion to the vampire sire. After choosing to become what she had always feared most, Allison is expected to learn to hunt, to feed and fight. When she suddenly finds herself on her own, she stumbles across a group of humans and finds herself accepted into their community. If only they knew that she was nothing more than a soulless monster. She finds herself attracted to Zeke. With his boyish charm, the friendly pacifist is more than just a meal to Allison. But would he ever feel the same if he knew what she truly were? They group have been searching for the safe city if Eden for years. On the run from raiders and a vampire overlord, they soon discover that Allison isn't one of their kind. As she is forced to leave the group, she covertly follows them, guarding them and helping Zeke and the group fund Eden. Surely a soulless monster wouldn't care, right? With nightmares seen through the eyes of her sire, and the group being found by raiders, surely there is a better life for the humans out there. 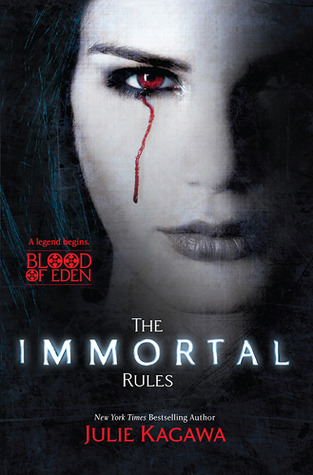 I devoured The Immortal Rules. It was a unique and well written vampire novel, but with a post apocalyptic twist. You'll find yourself swept into Allison's world of destruction and devastation. Allie isn't your average heroine, she's tough, can wield a sword and you'll connect with her personal journey from human to vampire. A supernatural, paranormal romance, set in a dystopian, post apocalyptic world. If it were legal to marry an inanimate object, The Immortal Rules and I would be living happily ever after in wedded bliss by now.